It’s hard to argue with success! So why not build on it? During the Christmas season we began a series of highly successful experiments to leverage KDP Select’s FREE promotion option. The result was nine titles in the top 100 FREE Kindle books and Top 100 PAID books. Building on that success, FREE Par-Tay was born. In February, a group of carefully selected authors linked arms to conduct a three day FREE event which resulted in AWESOME numbers. All but four of the 40 participating titles ranked in the top 500 FREE and all were ranked under 1000 FREE. In March, the Lucky Days FREE Par-Tay’s success was nothing short of phenomenal. Out of 60 titles, 16 were in the top 20 FREE! Stephanie Bond had three of the top five titles on the free list and her traction continued when she moved to the paid list. At one point, two of Ann Charles’ titles were in the Amazon Kindle top 20 — one was Free but the other was on the PAID list. During Lucky Days FREE ParTay over 1 million ebooks were downloaded and over 100,000 were SOLD, bought and paid for! ASTONISHING! Now we’re going to do it again! 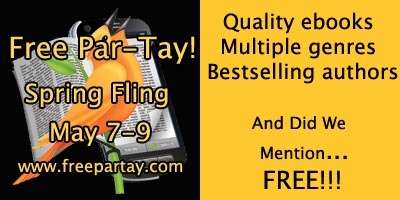 May 7-9th dozens of ebooks will be FREE as part of the Spring Fling FREE Par-Tay. The books offered are a diverse assortment, including romances (from sweet to HOT), thrillers, mysteries, horror, humor, poetry and more. But it’s not only the books that are diverse. A wide spectrum of authors will be taking part in the event. From established, New York Times best-selling authors to critically-acclaimed but relatively novice authors. For example, in Lucky Days, Lois Lavrisa’s debut novel soared into Amazon’s top 100 paid list where it stayed for over two weeks and is still in the low thousands. Without question, FREE ParTay is a career changer for Indie authors at every level! We are not content to rest on our laurels. We are constantly growing and changing our events to respond to an ever evolving landscape. In Spring Fling we are charting new waters in social media. We are upping the ante in both paid and free advertising, and working together to cross promote in new and exciting ways. We hope to make this ParTay the BEST one yet! And we aren’t stopping the PARTY at the end of the FREE Par-Tay. Following three days of FREE we have scheduled a three day Spring Fling Indie Book Blowout (May 10-12), with a special bonus Mother’s Day event. All of our titles will be priced at 99 Cents for the four day period. A great way to build on the momentum of FREE allowing our titles to soar when they segue back to paid. Our goal is to lift the average FREE ranking of our participating titles to less than 1000 and the PAID ranking to less than 2000. A lofty goal indeed! But that’s what the Indie Book Collective is all about. Fearlessly claiming the future and willing to challenge an ever changing marketplace. KDP Select and the FREE Option have revolutionized ebook publishing. In less than five short months, ebook publishing has gone from the slow lane into the jet stream. In response, the ever innovative Indie Book Collective, specifically through the FREE Par-Tay/IBB events, intends to make ebook promotion supersonic! Want to be part of the next exciting FREE ParTay? Email us at freepartay@gmail.com. We’d love to welcome you aboard! par-tay in the penthouse. marty party!!! !